Last night I was looking at the web and I saw an indoor rock climbing center near Miramar and made it my goal for today. I have been wanting to try it for sometime. 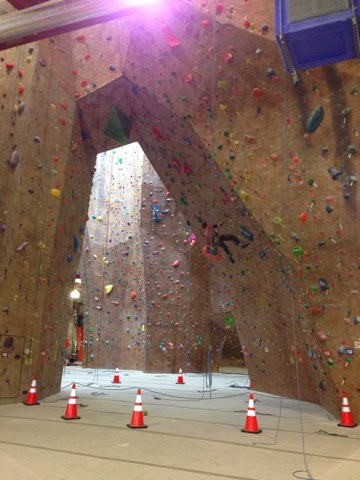 They offer a Beginner's Belay Class each day but only have 4 slots per class. This is the required prerequisite to climb unless you are climbing on a mechanical belay. Well I should say it is a prerequisite for someone to climb as you need a trained belayer for you to climb. I thought this would be a good thing to do with Madison and Taylor as they both like to climb. 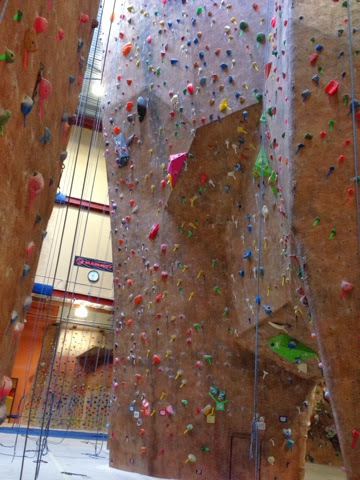 Also I was looking at doing this at the Worcester indoor climbing facility but never went. 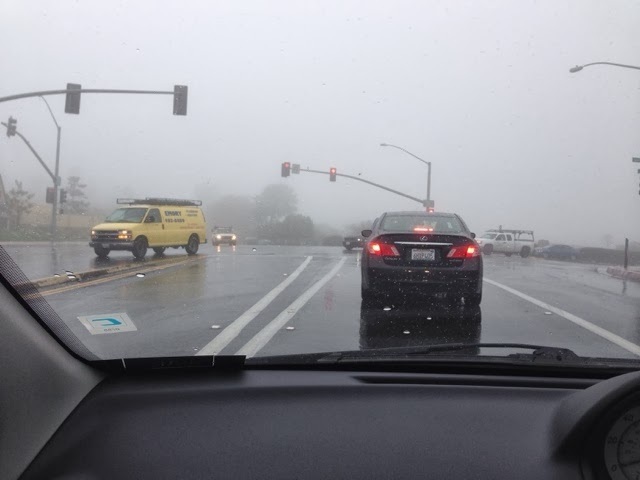 The weather in San Diego today was rain all day, sometimes heavy and very windy. This weather backdrop provided for the opportunity to do something inside. I arrived at Merimar Rim indoor climbing center about 9:00 to find out about the beginners program and sign up for the class at 3:00 if an opening existed. I walked in the door and saw the vast high walls marked by colorful hand/foot holds. Some walls reversed to make for very chalenging climbs. I was greeted at the desk by a woman more than willing to help answer all my questions. I was always courious of folks on the fire department that did climbing when we had a tech rescue team. I always thought that I didn't like heights I wouldn't like this. 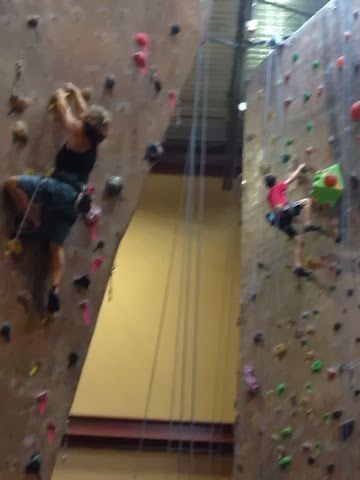 I learned that it was $8.00 for the class and that I kind of needed a partner as your belay class is around someone climbing and you can't do both jobs. Climbing is not the technical stuff it is managing their lines and supporting them so they don't fall to the ground if they loose hold of the wall. I signed my life away in a waiver of liability and then signed up for the belay class for 3:00 pm as there was no one anyone yet. They were ok to signed up without a partner as I will have to imagine managing the rope for a make believe person. As I had all day until my class I went home and did some things with the camper to get ready for the next leg of my trip. 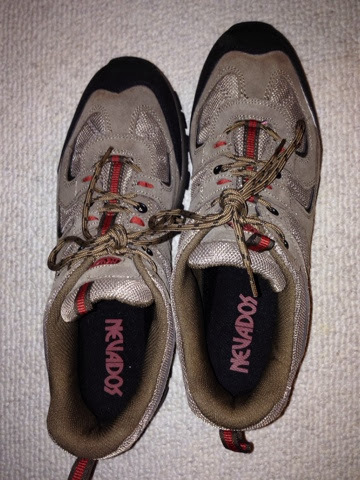 Then I headed out to the UTC Mall to see if I could bind some new sneakers for the climb as my current Merrells were kind of dirty from the dusty trail hikes. They are still in good shape for hiking but this climb is inside and a clean environment. I found some sneakers just what I wanted for $29.00 at sears on sale. Couldn't beat the price for quality, and although a bit loose until I get some suitable inserts they were good for today. I headed over to the climbing center now at 2:45 arrival for my 3:00 class and checked in and paid my $8.00 and was given my harness. I then looked around at the equipment to study it all. 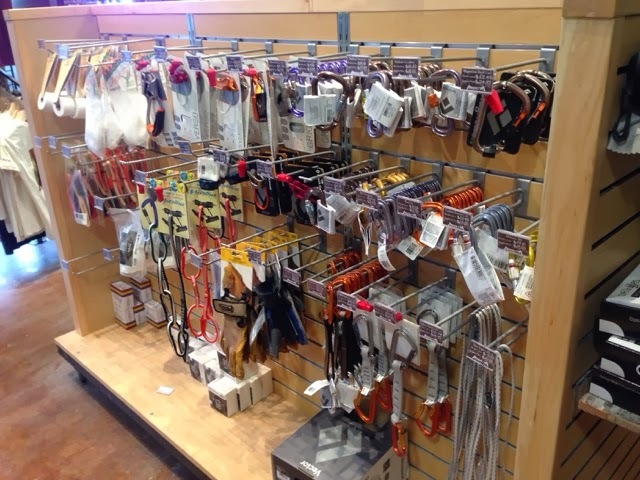 Carabeaner, belay devices, and chalk bags here. Here special shoes and harnesses. 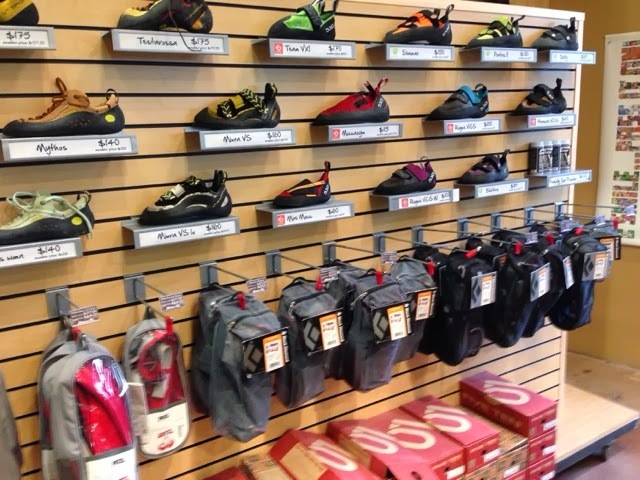 Basic shoes at $100 if a member and Harness that is basic is $60 and the one with carabeaner and chalk bag for $100. So for a couple hundred dollars you would not need to rent equipment. Oh I forgot to tell you that to be certified or checked out to get your tag to belay there you need to come back after at least one day to be tested on remembering what you were tought in the class. I was kind if aggravated that I had not done the class yesterday and then I could test today, but I have tomorrow (Saturday) to come back before I leave Sunday. While hanging around I watched 2 woman who had taken the beginners belay class some time ago test out and intentively watched and absorbed as much as I could befor my class started in 10 minutes. It was now time for my class and I first needed to learn the figure 8 knot as this is the Knot used for the climber. 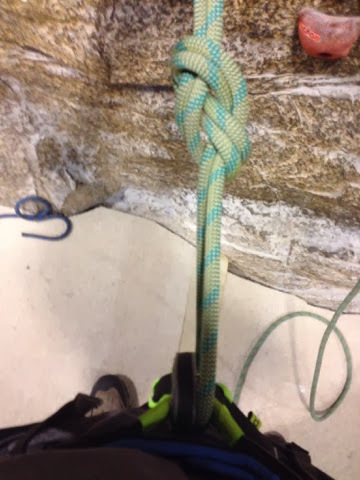 You turn it into a double figure 8 by passing the rope through the harness I am wearing and then trace the figure 8 back up through the knot to finish this off. My next thing I learned was belaying. My class instructor was great and in one way that I was the only student as I got full attention. The bad part was I didn't have a partner still to practice my skills with. No picture but the carabeaner hooks though the two loops that the climbing rope passed through above. Then the rope gets bent and passed through the belay device that has a metal loop and the carabeaner is used to loop both. I needed to then learn the command terminology, hand placements, rope management and so on. Now the instructor was determined to find someone as my partner to tryout what I was taught or better stated what I had learned. We walked through the walled canyon of climbers and after getting turned down twice she found a willing well fit 30 something man who agreed with a wide smile. We went to the wall and I learned that I needed to tie the climbers knot and climb the wall. I thought this was a belay class. I learned that I needed to know what it was like to be belayed. 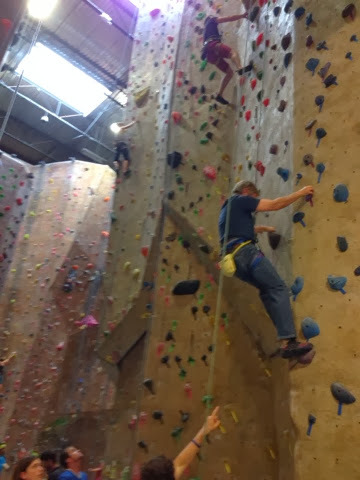 I scaled the wall to the top hitting the rope connection at the top and repelled down. Did I just do that? Yup, and no feeling of fear. I don't generally have fear when I am holding on and know the mechanism and I tied the knot and I was in a comfort zone. That was fun! Now to let the man climb and I belay him. I did well and pased the beginners class. Determined to come back tomorrow to certify I was offered the opportunity to stay and rehearse what I had learned and I did just that. Over and over again I went through each step by myself for an extra 1/2 hour. Feeling confident with my work I left to meet the girls for dinner. I met the girls and we went to dinner and I picked up some Ben and Jerry's New York Super Fufge Chunk for desert at home. Hi Brent. I was searching your blog for how you handle wet things (like getting clothing caught in the rain) in your prius and came across this post. Not related but at least you talk of "rain." :P So with anything like a van or bigger, you can hang something up inside....inside a prius, not so much, eh? I'm wondering what you would do with an entire outfit (shoes included) that got soaked while out on a walk...thx. (I just got drenched and thought of this haha). I'm glad you brought the question up about dealing with wet things. I have been thinking about creating a post about this subject this week. Dealing with wet things is no fun in a hipumid climate regardless of it being my Prius or the Class B I had. The problem is the moisture getting into the air and when the temperature drops at night condensation becomes a problem, especially on the windows. Wake in the morning and a dry hand towel is soaking wet cleaning the windshield. One of my recent posts on bathing in the Prius I neglected to say what I do with the two wet drying towels and wash cloth. I recommend in places of higher humidity and when the temperature will go down to the dew point is to plastic bag the wet items overnight until the next day when the higher temperatures allow moisture to evaporate into the warmer air. Hot air holds more moisture than cooler air. Back to drying in my Prius. I leave my privacy cover in the back in my living design. It is vinyl so I lay the wet towels on top of it during the day to dry. Now if I'm not stealthing where moisture on the windshield is an issue and where running the Prius engine is not a problem I will run the Prius heat with A/C to dry out things for about a half hour. My wet coat will hang over the front passenger seat. Shoes sit on rear drivers side floor where my seating area is. I have a hiking rain suit and my hiking boots are waterproof so my clothing generally is not overly wet from absorbing water. The more I read about the lifestyle, the more I envision this like backpacking with a Prius as opposed to a tent. So many similarities. ;) Thanks! And if you are near Southern CT some time, please let me know! There are a lot of backpacking similarities, but a bunch more comfort. A few great advantages of Prius vandwelling are having a fixed bed, Prius generator, house battery, compressor fridge, and climate control. Also the ability to change my scenery and fit in just about anywhere. Thanks for the contact offer. My email is at the bottom of all my blogs if you are in central MA. You bring up a real concern. While testing my Prius first gen design in December of 2014, sleeping in my car, in the cold without using the Prius to heat, was can I really do this? I worried about claustrophobia (never had it and was a firefighter), spending so much time with myself and not liking it (have always been around people). What if these things happen and I'm on the road and far from home? Claustrophobia did not happen. In fact when in in my bed sitting I have no sensation of confinement. Loneliness did not happen but my desire for meeting people meant my personality altered to take every contact with others (anyone) as an opportunity to talk. I'm much more outgoing on the road. These are all individual factors that each person has to figure out for themselves, but here is a list of things I do on the road. - Download more podcasts than I have time to listen to. - Downloaded books but don't read as much as I would like. - If it works out I take myself to the movies once a week. - I take myself out to eat once a week - generally go where there is an opportunity to sit at a bar/counter so I can drum up conversation with others. - I get out and do something every day - hike, museum, fair, driving tour, visit library, and do on. - Write my blog posts - this is pleasurable to me. Helps give me purpose in life on the road. - Plan my next move or adventure. You get the point and the list goes on. You need to find what may work for you. I believe traveling is a chance to find your true self and enjoy the simple things. "- I get out and do something every day - hike, museum, fair, driving tour, visit library, and do on." <- that point really stands out to me as some of those things are free, and some cost $. Since I know I am a social person, I want to do a bunch of those things and entertainment budget will be a concern. It's good to know u didn't go nuts in the the Prius, but I know I will want to fill my schedule with lots of things to do and get out there. Thanks for your thoughts, I really appreciate it. I belong here and in Tucson where I spend much of my time in the southwest. They are generally free except when they hike from the federal parking spot at Sabino Canyon. There are lots of hiking and I could hike every day at no cost. Just like Boondocking parking at events can usually be found for free. You should look into meetup.com as they have all kinds of group activities. There are free museums and I disc golf for free all over the US.